As readers of Amrit Kirtan are aware the magazine, under the aegis of Amrit Kirtan Trust, is being published from Chandigarh since 1989. It has over the period of time, almost become synonymous with the name of the Hony. 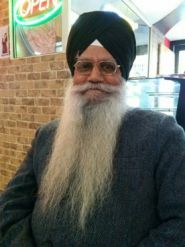 Editor, Dr. Jagir Singh, Retd. Deputy Director, Punjab School Education Board, who, after his retirement from the Education Board, was appointed as Chairperson of Department of Gurmat Sangeet, Punjabi University, Patiala, from which post he retired on the 31st December, 2009. The Department is now being looked after by his youngest brother, Dr. Gurnam Singh, who is bringing laurels through his achievements. Gurmat Sangeet is an independent music tradition within Indian music. It began with Guru Nanak. He propagated a spiritual message to people and began binding it in ragas. The ragas used were both the ones which were inspired by folk traditions and the ones that the Gurus created. Prominently two traditions dominated. The Desi (folk) traditions (like Raag Majh and Asa) and Sanatani traditions (like Seri and Gauri). The Punjabi University has recently launched a new Website "GURMAT SANGEET PROJECT", which will definitely prove to be a boon for the lovers of Gurbani, Gurmat Sangeet and Gurmat Literature. They have done a Yeoman's job in undertaking the stupendous task of preserving the literary and music treasures. The demand for professional ragis is increasing in India and abroad. This is helping hundreds of boys and girls from rural Punjab in making career in this field after procuring a professional degree. The Department of Gurmat Sangeet, Punjabi University, is helping them to strike the right chord in this direction. Dr. Jagir Singh wrote a booklet "Mere Dada Ji" in anecdote format for young children. The educative and inspirational booklet was first published in the year 1985. An other edition was brought out in 1989. Still an other edition of the book - under the title "Dada Pota" - was brought out in the year 2005. It is now being presented to our viewers in digitalized form for easy access.